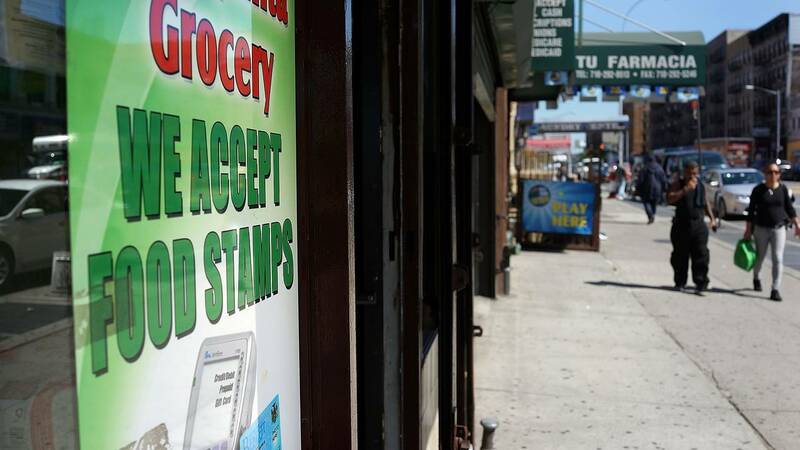 (CNN) - The nation's 38 million food stamp recipients will get their February benefits early amid the partial government shutdown. State officials say their allotments will be loaded onto electronic benefit transfer cards by Sunday, rather than next month. That's the only way the federal government can make the payment since the program initially wasn't funded beyond January. The change has left states racing to issue the February benefits -- which are expected to total $4.8 billion -- by January 20. Typically, states issue benefits over the course of a month, in part to make sure grocery stores have enough food and to provide them with a steady stream of customers. Households receive $245 a month, on average. "It's certainly a compressed process with a high degree of urgency behind it," Flagg said, noting that some states have experience doing this because they have had to issue special disaster-related benefits to their residents. Equally as important, however, is communicating to food stamp recipients that the money they are getting now is their February benefit, and they won't get more until March, at the earliest. At this point, the USDA doesn't have funding to guarantee food stamps will be issued in March if the budget impasse isn't resolved by then. "Families should be mindful of this when they are planning their shopping for the month and budget accordingly," said Jeanne Lambrew, acting commissioner of Maine's Department of Health and Human Services, which paid the benefits on Thursday. Florida, for instance, posted a message on Twitter alerting its 2.9 million residents in the program that they'll receive their benefits on January 20.